So, you want to learn guitar? How about we take you one step further and teach you music? We teach the musical essentials when learning guitar, which is why we're so different. Learn the valuable skill of reading music, as you learn guitar! This is often overlooked, and as a result, there is confusion later on. I want you to understand music and guitar together, so you have a complete foundation, ready to play in any style and at any level! Rhythm is how music moves through time. I’ll teach you about note values, time signatures, and more, so you can confidently play rhythm guitar like a pro! A good guitarist knows that playing both chords and melody is important. I’ve written songs with backing tracks that make you better at both of these things, while also having something to show for it. Learning should be fun after all! 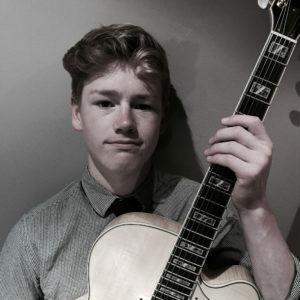 Zac Pugh is an Australian based musician and guitar teacher. After picking up the guitar at age 11, Zac has been playing and studying music ever since. His teaching style is relaxed and he has a friendly, positive attitude. Zac has completed his Bachelor of Music Degree at the University of Tasmania and was awarded the Dean's Role of Excellence in 2006. Zac has taught guitar to hundreds of people from ages 7-70. Some have just wanted to learn some basic chords and strum along to their favourite songs. 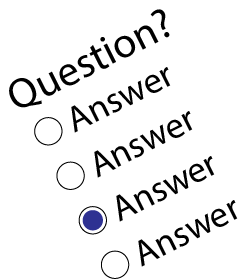 Others have studied guitar with Zac to excel at college level music and performance subjects, while still others have focused on composition and song writing. "The great thing about the guitar is you can play so many styles on it. I’ve always loved the flexibility it gives me as a musician." 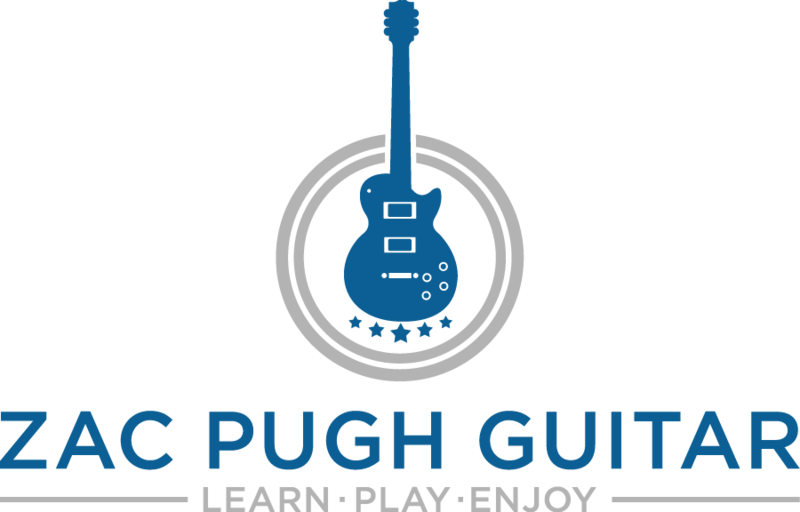 Zac’s latest project has been working with good friend and business partner Simon Petrusma to create the Zac Pugh Guitar online teaching platform. 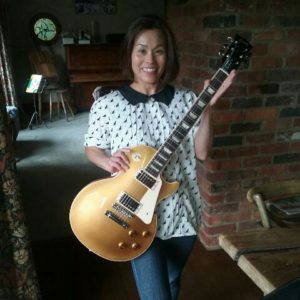 The intention was to be able to teach people guitar from the beginning in a really convenient and affordable way. Zac’s personal musical interests include composing in a variety of styles such as Rock, Blues, Jazz and Pop. Whenever there’s a moment of spare time Zac loves to lock himself away in his private studio where he can create and explore music making and pushing his skills to new limits. For Zac, guitar is a journey which will take more than one lifetime to fully discover but, the journey is what makes it fun. I wrote this song for my Nan when her cancer started to get nasty. I was lucky enough to be able to play it to her before she passed away, and she loved it. Though she's gone and I still miss her, the song remains. Here's a little acoustic song I wrote for my daughter the day she was born. The song just came out and I think it suits her! Hope you like it! What's involved in learning guitar? What sort of gear do I need? These are all good questions! I'll answer all of these for you, plus many more in the ​Guitar Basics course. You'll learn how to read 8 notes of music, you'll learn some basic rhythms and some simple chords. You'll also get to play some songs to consolidate what you're learning - and have something to show for it! 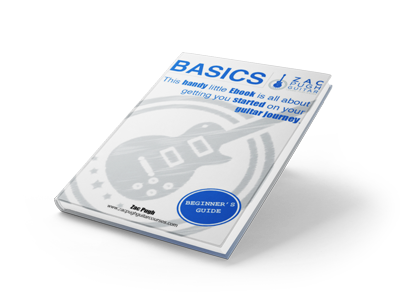 Begin your journey of playing guitar with this self-paced course. We'll grow your skills right from the start. Building on from the last course, you'll be introduced to more notes, more rhythms, more terms and symbols, and most importantly, more songs to increase your skills! In this course, you'll see huge improvement. We'll look at how to play scales, understand keys and key signatures, improve your sense of rhythm, and with the introduction of semiquavers, you'll be playing faster! As always, there are plenty of songs to play so you can put it all into action! Not for the faint hearted. Level 4 is where you'll need to call upon your previous learning and experience as we look at some exciting new concepts to make you awesome! Multi angle lessons designed to teach you clearly and logically. You'll almost feel like you're right there in the studio. Lock in what you're learning with the lesson quizzes. Fun, Quick and Rewarding! 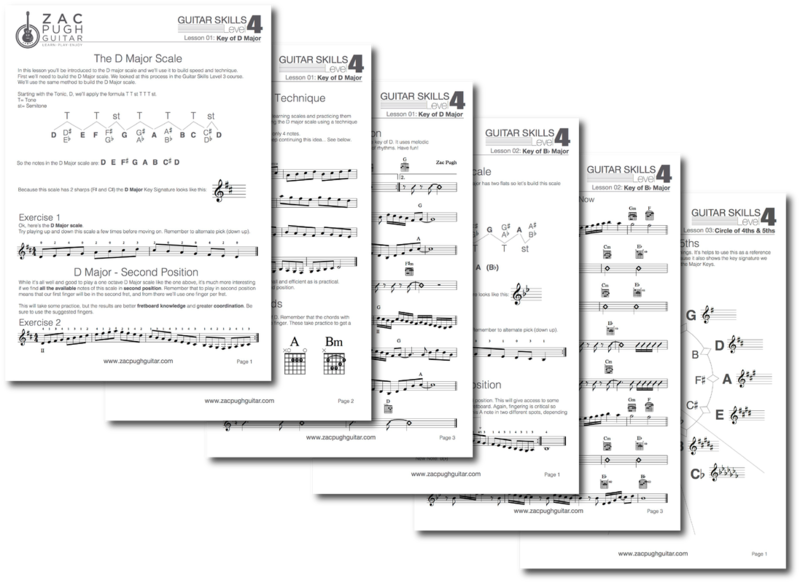 Practice is made easy with these beautifully designed reference sheets. 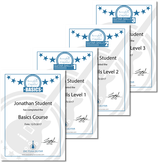 Complete the course and get a personalised certificate. It's good to celebrate the milestones. Yes, I'd love to learn guitar! Special note for educational organisations: We offer discounted rates based on the number of licenses purchased. Contact us at zac@zacpughguitar.com to get a quote. When you consider how much you might pay for one-to-one lessons, our online learning platform is nothing! One-to-one lessons are normally $25-40 per 30-minute lesson, meaning what you pay for 30 minutes is roughly the equivalent to one month here! Also, don't forget the time it takes to commute to and from your one-to-one lessons, as well as the head space required to 'get in the zone', the commitment to turn up at a set time, and it goes on. One-to-one lessons are a fantastic way to learn guitar, but they can be expensive and difficult to organise! The value you get out of our online learning platform is huge. Not only do you get step-by-step lessons on how to play guitar, but you will also learn music. Inside, I'll teach you how to strum, pick, and all the other basic skills, but I'll also teach you how to read music, understand music, and create music of your own. That's our emphasis: learning guitar in the context of learning music. Anyone can pick up a guitar and play some TAB, or copy come chords. But it takes a structured approach to learn music itself! I have had the pleasure of learning from Zac personally over the years. His style of teaching has been so helpful to me. I am so excited that now anyone, anywhere can learn guitar from him. Thumbs up from me! I began private guitar lessons with Zac as a beginner last year. I found his teaching approach friendly, relaxed and well structured. Lessons were well planned which helped me improve much faster than I thought I would! I have learnt a variety of techniques in each lesson. Most of the songs Zac uses to teach me are all composed by him, specifically to improve different aspects of my playing. The recordings are so helpful when practicing at home at my leisure. Zac has proved himself to be totally professional, an experienced teacher and a great musician. He is, importantly, extremely patient and enthusiastic with a warm and helping personality. I highly recommend him to total beginners and more accomplished players!! © 2019 Zac Pugh Guitar. Enter your name and email address and we'll send you instructions on how to access your free 14 day trial. Your information will be kept safe and secure.